Thirteen years ago today Slobodan Milosevic fell. Despite being one of the founders and leaders of Otpor, the student-led movement that was key to his overthrow, I had to experience that historic day from within the military. Thirteen years ago today Slobodan Milosevic fell. The Butcher of the Balkans, as he was called in the West, was brought down without a single shot fired. Although this fact is taken for granted in Serbia today, at the time people feared he would not step down no matter what, even if that meant spilling innocent blood. However, despite images one could see on CNN of trash cans turned over, windows smashed and the Parliament in flames, the uprising on October 5 ended peacefully; there were only two casualties — one traffic accident and one heart attack. It was a pinnacle of a 10-year-long struggle… and I wasn’t even there. Where was I on October 5, 2000? A few weeks before, I was drafted into the Yugoslav Navy. I was sent all the way south to Montenegro and ended up on top of some hill, isolated, just a few days before the elections on September 24, which Milosevic lost but refused to accept as a defeat. What happened next was a 10-day-long campaign of civil disobedience — and more than a week of strikes, road blockades and protests — that brought the whole country to a standstill. It ended with the nonviolent takeover of the Parliament and other state institutions. And I wasn’t there. I did not even have the means to learn about what was going on outside of the bush in which I was stationed. I did manage to get a tiny Chinese-made radio, but the antenna was so weak we couldn’t receive any signal. So we tied it to a very long wire, coiled it around a tree and there we were, a dozen soldiers sitting around this tiny device, trying to figure out what was going on. We learned about the blockades and strikes, the most significant one being the refusal of miners in the Kolubara mines to supply coal for electricity production, which threatened to leave Serbia in total darkness within a few days. We learned about the opposition’s plan to converge on Belgrade from all parts of the country and demand that Milosevic accept the defeat in the presidential elections. If he did not step down by 3 p.m. on October 5, the people would show Vojislav Kostunica, the opposition candidate who won the presidential race, into his office. This is what we learned on October 4, the eve of the uprising. I remember I couldn’t sleep that night. I was lying in my tent, eyes wide open, thinking about my friends in Belgrade. In the end I did fall asleep, and I awoke the next morning to learn that all the officers mysteriously disappeared from the camp, leaving us under the command of corporals and a few sergeants. We had breakfast and went to our tree, turned on the radio and learned that the first convoys were already heading towards Belgrade. It was happening. Needless to say, this suggestion immediately lowered my reputation as a rebel, but what else could I suggest? The whole point was to challenge Milosevic in the elections, even though they would not be free and fair — to mobilize people to vote against him, to defeat him under his rules of the game and then, when he attempted to falsify results, to force him to admit he lost through mass civil disobedience. The desired role of the armed forces in this uprising was to sit it out, neither to crush nor to join the protests. This was between the people and their president. As I was standing there, my revolutionary aura disintegrated in front of my comrades. The officers came back to the camp. They lined us up and conducted the morning drill as if nothing was going on in the country. The whole day went like that: the usual, pointless military activity. The only strange thing we noticed was that the officers were often making calls on their private cell phones. But they kept us busy until lunch. After we ate and were about to enjoy our regular hour of free time, we ran back to the tree. It wasn’t three o’clock yet, but we needed to know what was going on. As we were attaching the antenna to the wire, an officer jumped out of the bush and confiscated the radio. He said he could not risk his soldiers being exposed to misinformation and that we should receive all the news about what’s going on in the capital through official channels once they’re confirmed. This was a disaster. I didn’t know what to do. But I was in the army, I had to do what I was told. I was told to dig latrines. And dig latrines was what I did for the rest of the day. So there I was on the evening of October 5, completely cut off, not knowing if the uprising succeeded or not. I went to bed — in a sleeping bag to be more precise — worried about what tomorrow might bring. And the first thing that happened in the morning was a shocker. We were lining up, not yet fully awake, shivering from cold water and chill in the morning air, when an officer came to me, shook my hand and said: “Congratulations. You won.” This is how I learned that Milosevic fell. I didn’t know what to say. I couldn’t believe this was true. I was standing there, trying to make sense of what I had just heard when another officer announced to the whole unit that the change of government took place, that the Army would stay out of politics and perform its constitutional functions. That was it. It was over. He was finished. Time to eat. After breakfast I was told to go to the officers’ tent, where I was given newspapers and brandy — my first alcohol in weeks. The officers wanted to know everything, and I tried to answer their questions. My radio was given back to me, and I felt so relieved that it was over. Why am I telling you this? Maybe this reads like one of those war stories that Grandpa Simpson tells, but I’m not that old. I wasn’t there to witness the climax in the streets of Belgrade, but I had a unique opportunity to experience it from within one of the regime’s security forces. This perspective assured me that a regime is not a Leviathan, but Voltron — that ghastly giant robot assembled of smaller robots; not one entity, but a number of very different institutions. Inside those institutions, there are very different people — some more loyal than others, some more brutal than others, some more motivated than others. 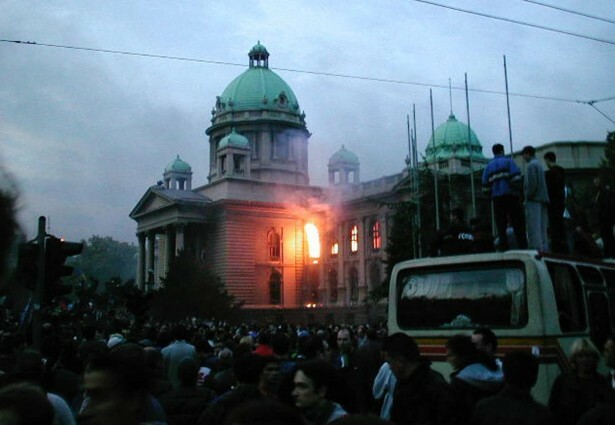 The army on Oct. 5, 2000, was not made up of just generals who may have been willing to defend Milosevic, but also soldiers whose hearts were with the people and officers trapped in the middle. Even I was in that army on that day. This is why mass, broad-based, nonviolent movements have a chance. If they do everything right. Ivan Marovic is an activist, software developer and social innovator from Belgrade. He was a student organizer and one of the leaders of Otpor, the student resistance movement that helped bring down Slobodan Milosevic in 2000. I am an academic researcher working with the Journal of Humanitarian Assistance at Tufts University, writing a paper about Serbia in the 1990s. I wanted to know if I could discuss your experiences in Otpor sometime. Please let me know.